On Friday, May 1st, I got this email from someone named Willie Jackson who had happened upon my website. Pretty neat, right? It gets better. He’s also studying IT (in California) and was instructed by his professor to do a vanity search. His unedited message is below. True story… I’m finishing my Associate’s degree for Information and Technology and in one my classes, during a discussion about reumes, my professor tells me that I should Google my name and see what comes up. 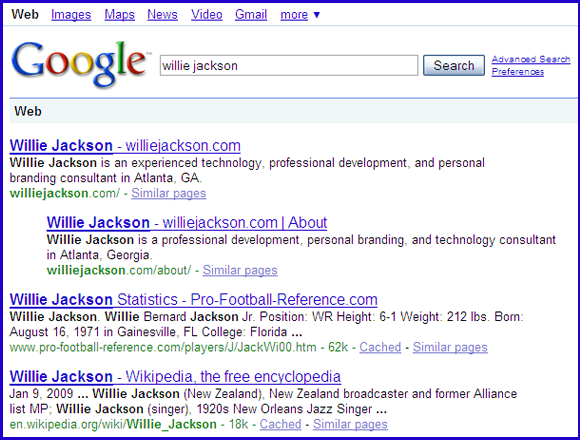 To my surprise, there was a website called williejackson.com at the top of the results. I was even more surprised when I learned that the site had tips on resumes and maintaining a good web image (which was the very topic that lead me to Google my name in the first place). I was pulled over for speeding once and the officer told me that there are at least fifty Willie Jacksons in California with warrants out for their arrest. Needless to say, I rather be mistaken for you than for any of them. Anyway, I will have my Associate’s degree in June and as I continue working towards my Bachelor’s in Computer Science, I will check your site frequently for more tips and information. Keep up the good work! P.S. How do you start a career in web design or programming when all of the openings seem to be looking for people with 3 – 5 years of experience? Not bad, eh? Because of his email (and the fact that he has the greatest name on the planet), I will certainly be making myself available to him regarding his questions as he moves towards graduation and full-time employment. He’s keen to point out what is often a catch-22 in the IT field: employers want years of experience, but they won’t always give young professionals a chance to gain that experience with their company. A subtle lesson here is that when you’re establishing your personal brand online, you need to move quickly. I have a three-year head start on anyone who shares my name if they’re trying to build an online presence. I own multiple variations of my domain name, and this site is built on what is perhaps the most SEO-optimized WordPress framework on the planet – Thesis by Chris Pearson. You’ve got your work cut out for you if you want to dominate the search results for my name.